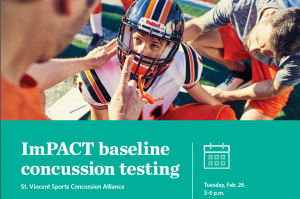 St. Vincent Sports Concussion Alliance will be offering free Baseline Concussion testing on Tuesday, February 26th from 3:00 to 6:00 pm in the St. Vincent Center for Advanced Medicine computer lab on 4th floor. Registration will open on February 11th and can be done on line at https://healthcare.ascension.org/Events . Attached is a flyer that can be posted and distributed with additional information. Please call 812-485-7095 if you have any questions.